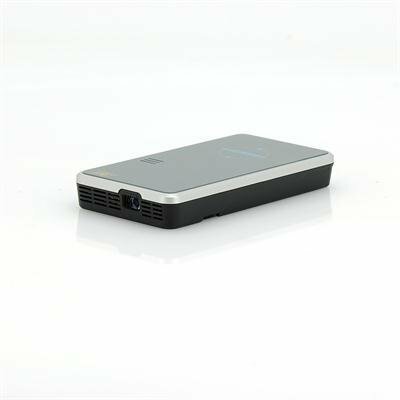 Successfully Added Mini DLP Pico LED Projector - 50 Lumens, 1000:1 Contrast, Micro SD Card Slot, 1/4 Inch Tripod Thread to your Shopping Cart. DLP Pico LED Projector with 50 Lumens and 1000:1 contrast is a well designed compact projector that's just the right size for your pocket so you can bring all your media to life anywhere you roam. A ergonomically designed projector that due to its lightweight design can be taken with you everywhere, this projector is the ideal way to display your media from your mobile phone, tablet or other compatible source. To create the images it uses DLP (Digital Light Processing) techniques, which is a method where images are created using microscopically small mirrors are laid out in a matrix on a semiconductor chip, known as a DMD (Digital Micromirror Device). Each one of these mirrors represents one or more pixels in the projected image. The number of mirrors corresponds to the projector’s resolution and these mirrors are rapidly repositioned so as to reflect light through the lens. This mini projector has 50 lumens, but it will seem like a lot more than that while remaining more effective and efficient than a standard LED projection thanks in large part to the DLP technology it uses which allows it to perform exceptionally well without requiring a high number of lumens. With input ports for USB, AV and a micro SD card slot there are plenty of options for hooking up this projector to a wide range of devices. The micro SD card slot can support cards up to 32GB so you can download films on to your computer or even phone and then use the card slot to access them on this projector. The audio out jack will allow you to connect independent speakers and the built in battery provides enough power for 80 minutes usage and the accompanying power adapter can be used to recharge it whenever you need. 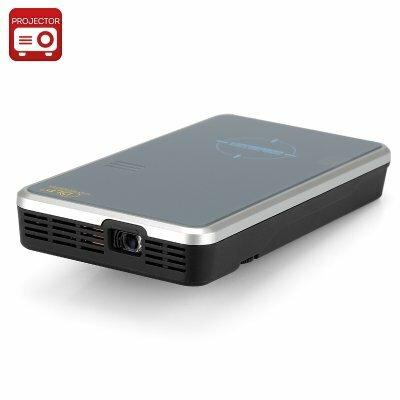 This DLP projector would be hugely beneficial for the business professional or educator as it allows you to give presentations anywhere without the need of a bulky projector. The remote means you can control the action from anywhere in the room and there is even a 1/4 inch tripod connection so you can use it with a portable stand for more flexibility.